Giancarlos TRONCOSO PARADY, Assist. Prof. This entry was posted in 未分類 on 2019/04/04 by admin. 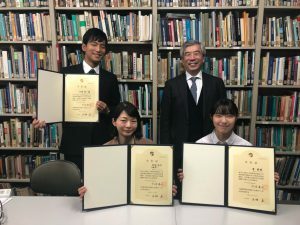 Three master-course students and two undergraduates graduated this spring. Congratulations! This entry was posted in member on 2019/03/26 by admin. This entry was posted in activity on 2018/12/26 by admin. 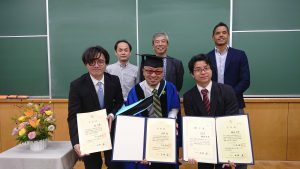 Our paper “Scenario Evaluation of Autonomous Vehicle Spread Using Agent-Based Simulation” (in Japanese), authored by Yo KAMIJO, Giancarlos TRONCOSO PARADY, Kiyoshi TAKAMI, and Noboru HARATA, was awarded by Japan Society of Traffic Engineers! This entry was posted in award on 2018/10/10 by admin. 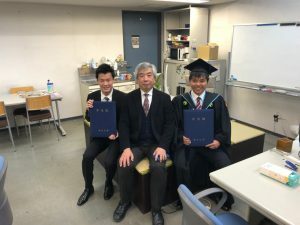 The autumn graduation ceremonies were held where 3 graduate students got their degrees. Congratulations and best of luck in your future endeavors! This entry was posted in member on 2018/09/18 by admin. This entry was posted in activity on 2018/09/03 by admin. Prof. Shengchuan Zhao was awarded the title “Fellow, School of Engineering”. On June 29th, 2018, Dean Tatsuya Okubo, School of Engineering, awarded the title “Fellow, School of Engineering, The University of Tokyo” to Professor Shengchuan Zhao, Dean of School of Transportation and Logistics, Director of International Office, Dalian University of Technology, China. Prof. Zhao is an alumnus of our research unit. This entry was posted in award on 2018/06/29 by admin. Prof. Noboru Harata made a keynote lecture at World Transport Convention 2018. Prof. Noboru Harata made a keynote lecture entitled “Sustainable Transport Strategy in Tokyo Metropolitan Region” at World Transport Convention 2018 held at the National Convention Center in Beijing. This entry was posted in activity on 2018/06/29 by admin. Prof. Harata took up the position of Toyota Transportation Research Institute Vice Chairman and Director General. Prof. Harata took up the position of Toyota Transportation Research Institute Vice Chairman and Director General on June 6th 2018. This entry was posted in member on 2018/06/29 by admin. 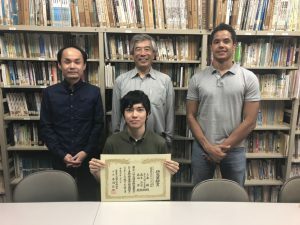 Our paper “”Metro-MaaS”, an Integrated Mobility Service Concept for Megacities: Concept Proposal and Demand Evaluation Aiming at Future Integration of Autonomous Demand-Responsive-Transit and Existing Public Transportation” (in Japanese), authored by Yohei FUJIGAKI, Kiyoshi TAKAMI, Giancarlos TRONCOSO PARADY and Noboru HARATA, was awarded CPIJ (City Planning Institute of Japan) Best Paper Award 2017! This entry was posted in award on 2018/04/23 by admin.